Since my first historical division layout video was a major success and a lot of people asked for more, I will do more, but first I have to address the errors in my original layouts, so here is a short update were I discuss the errors, some community contributions and of course the updated layouts briefly. First, the steam user ramadawn, who created a mod with various historical divisions, which is also available on the steam workshop. Second, the paradox user elfiwolfe for giving a lot of good feedback and creating a wiki page with divisions that are derived from my layouts with additional ingame values. In both cases I didn’t have time to check them out thoroughly, but from their conduct, comments and the data I looked at, I have a good initial impression. 1) Initially, I wasn’t sure if the Artillery Battalions ingame were actually artillery regiments or not. 2) I missed that the support units have less equipment and guns than their equivalent regular combat units. 3) I assigned far too small numbers of anti-tank units in the original video. The first part, the ingame artillery battalions are actually 3 historical artillery battalions, additionally the game files calls them artillery brigade. 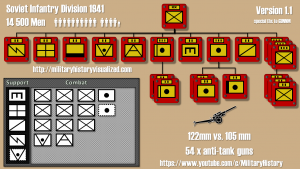 Whereas a historical artillery battalion had 12 guns the ingame has 36. For this reason the number of artillery units in my original videos were way too high. Second, I missed that the number of guns in the support units for anti-tank, artillery, and anti-aircraft is less than that of the regular combat battalions. Basically, a regular combat unit has 50 % more guns than the support version. This allows a bit more fine-tuning, but also note that the support units have special characteristics ingame that I won’t cover here. Third, in my original video I was far too strict on the anti-tank units. For some reason I neglected the ingame number of guns and used the German Infantry division as reference, whereas in this video I will set the ingame numbers in direct reference to the historical numbers. 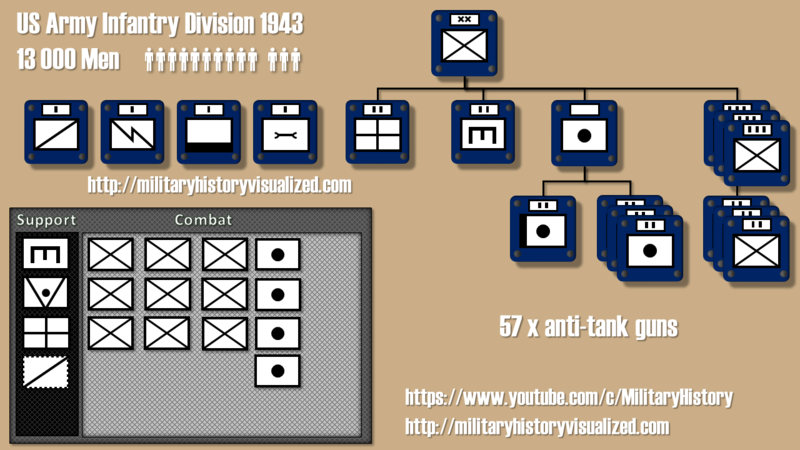 Since I covered the historical division setups in the original video, I will not narrate the whole setup again, so if you are interested in the background and haven’t see the original video you might want to check it out beforehand, it is mostly military history. Note that these units are optimized historical accuracy and not gameplay. Due to the high number of more than 70 anti-tank guns, I recommend to use 2 regular anti-tank battalions and remove the support anti-tank gun unit. 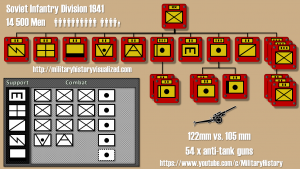 The number of artillery battalions should be reduced from 4 to 1, since the ingame artillery battalion are three times the size of historical ones. Now, since the historical unit had 48 artillery guns, an alternative setup would be to use no regular artillery unit, but two support artillery units, this would give the correct amount of artillery pieces for this unit. Since, we covered fifty shades of grey, time to take a look at Big Red, well no that is too scary, so let’s go with the Soviet Rifle Division from April 1941 instead. Reduce the number of artillery battalions to 1 or 2 units. Since, the division had 54 anti-tank guns and my original proposal had a regular anti-tank battalion included, one could add an additional support anti-tank unit. This would bring up the total ingame number of 60 guns, which slightly above that of the historical numbers. Yeah, well, the Fourth of July is over, but freedom never ends, so next is the US Army Infantry division layout from July 1943. The changes are very similar to the German and Soviet unit. Reduction of the artillery units to just 1 artillery battalion. 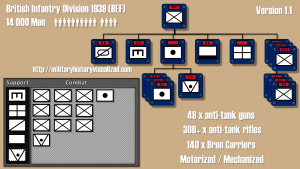 Then adding a regular anti-tank unit and also an optional support anti-tank unit, since the historical division had a total of 57 anti-tank guns, thus just being short 3 guns to be on point. 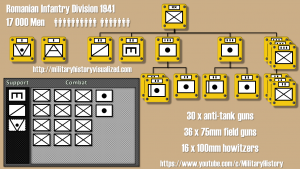 Also similar to the German division, it had 48 artillery guns, so an alternative setup could be no regular artillery unit, but two support artillery units, to get the same amount of artillery pieces as the original division layout. Now, if you like to call things Spandau, here we go, the British Infantry Division in 1939 of the British Expeditionary Force. I would add an anti-tank battalion and maybe an anti-tank support unit, although the real division had only 48 anti-tank guns, it had a large amount of anti-tank rifles. Also only one artillery battalion. The rest stays the same. 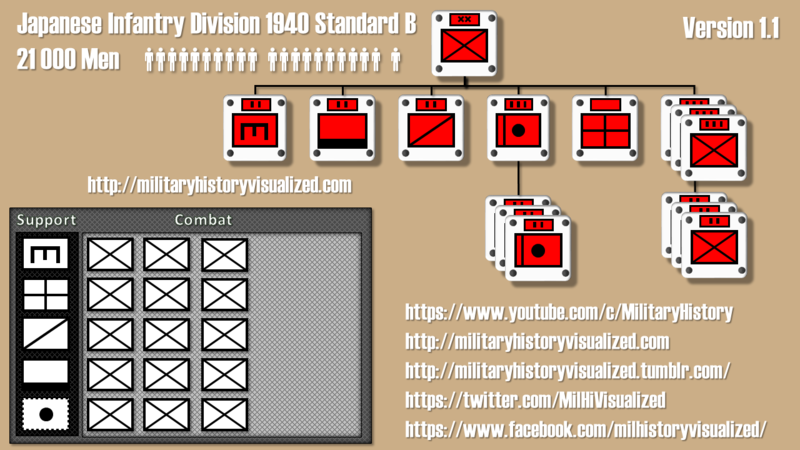 Now the war situation may still not necessarily develop to your advantage, nevertheless here is the update for the Japanese Infantry division Standard B around 1940. No regular artillery battalion, because of the very limited amount of firepower provided by the Japanese. At most one artillery support unit should be added. There should be a reduction of the regular artillery battalions to just one. Instead of the support anti-tank unit a regular anti-tank battalion and optional an additional one as support, similar to the US and Soviet division, because the French division had 58 anti-tank guns historically. 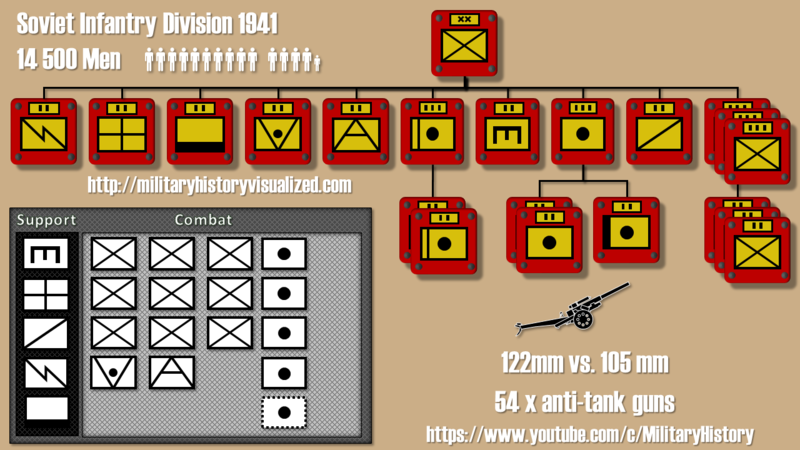 The once optional support anti-tank unit is now definitely a part of the division, because the historical division had 27 guns. Since the historical artillery was quite similar to that of the Italian division, no regular artillery battalion neither, just one support artillery unit. 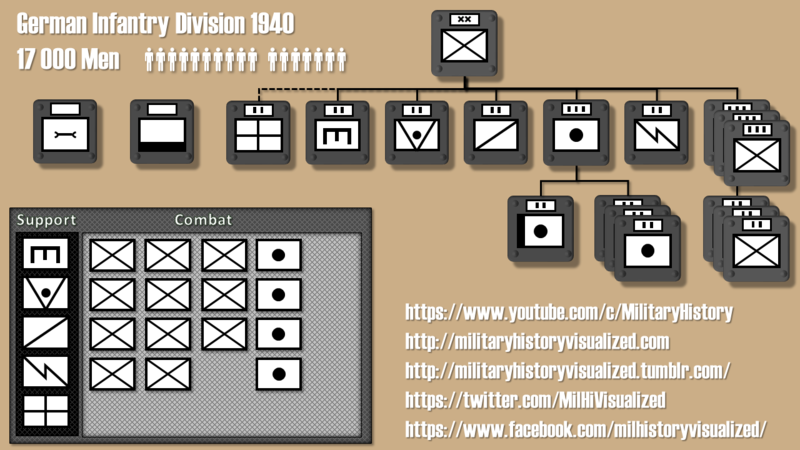 And the last division layout for this video, the setup of the Romanian Infantry Division of 1941. Now, once I realized that the ingame artillery battalions are actually the size of 3 historical artillery battalions, I added a suggestion to the Paradox Forums. Maybe there is a good reason for this, but I haven’t found one so far. Because, well there are enough slots in the division designer to support very large units. Additionally, the other battalions have mostly correct values for manpower and equipment numbers that are on par with historical numbers. If you think the same or otherwise, please check the link below to my suggestion post on the forums and add your thoughts and/or support there. Bernhard Kast is a participant in the Amazon Services LLC Associates Program, an affiliate advertising program designed to provide a means for sites to earn advertising fees by advertising and linking to amazon.com. Bernhard Kast is a participant in the Amazon EU Associates Programme, an affiliate advertising programme designed to provide a means for sites to earn advertising fees by advertising and linking to Amazon.co.uk. Bernhard Kast is a participant in the Amazon.com.ca, Inc. Associates Program, an affiliate advertising program designed to provide a means for sites to earn advertising fees by advertising and linking to Amazon.ca. Bernhard Kast ist Teilnehmer des Partnerprogramms von Amazon Europe S.à.r.l. und Partner des Werbeprogramms, das zur Bereitstellung eines Mediums für Websites konzipiert wurde, mittels dessen durch die Platzierung von Werbeanzeigen und Links zu amazon.de Werbekostenerstattung verdient werden können. Time to cover anti-tank tactics and principles, for this I took a look at the War Departments Field Manual 7-35 from March 1944 that covers the anti-tank company and other anti-tank units in an US Army Infantry Regiment. So let’s examine the company before we dive into the overall defensive setup, tactics and how to properly deploy a defensive position with anti-tank mines. An US Army Anti-Tank company of an infantry regiment consisted of a Company headquarters, 3 anti-tank platoons and an anti-tank mine platoon. The company headquarters had 35 men, each anti-tank platoon 33 men and the anti-tank mine platoon 31 men. In terms of equipment, the headquarters company had 2 jeeps, 2 0.75 ton weapons carrier trucks and a 1.5 ton cargo truck. Each anti-tank platoon had 1 jeep, a .50 cal machine gun, 3 trucks, 3 anti-tank guns with 57mm and 3 bazookas. The anti-tank mine platoon had 1 jeep and 2 trucks. So let’s take a look at the whole company, in total the anti-tank company had 165 men, 9 anti-tank guns, 9 bazookas and lots of other stuff. 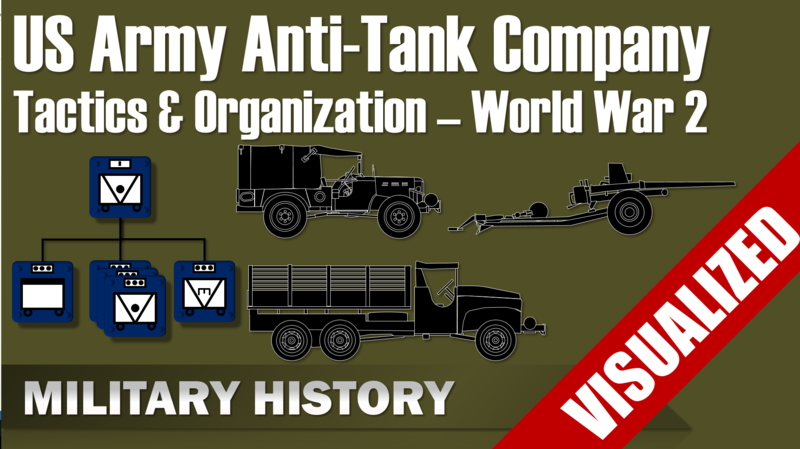 Note that the anti-tank company was part of the infantry regiment, which also consisted of 3 infantry battalions, which themselves had their organic anti-tank units, namely an anti-tank platoon each. Now, something about how the defense was organized. There are three firing positions, the primary, supplementary and alternate position. In order to provide effective fire and prevent giving away the positions too early, there were several rules in place. First the unit leader defined the ranges at which enemy vehicles should be engaged. (FM-7-35 March 1944: p. 124-125) Second, approaching hostile recon and decoy vehicles should not be fired upon, unless the superior commander ordered this explicitly, e.g., for an anti-tank platoon the company commander and if the platoon was attached to a battalion the battalion commander. (FM-7-35 March 1944: p. 124-125) This prevented giving away the positions of the guns prematurely and furthermore, the enemy should be engaged when he had committed his main force. In order to provide proper ranges, the squad leader for each gun was responsible creating a reference sheet, which he also copied for the platoon leader. (FM-7-35 March 1944: p. 160-161) Let’s take a short look at an adapted version of such a range card contained in the field manual. Now, such a reference sheet was rather simple, it contained the position of the gun. An indicator for the magnetic north and various reference points with names and distance from the gun. As you can clearly see, the defense is seen as a temporary situation until an offensive is possible or as a deliberate action in one area to provide the necessary forces for an attack in another area. Thus, on a strategic scale an offensive stance seems to be the determining factor. Besides funneling an enemy attack into certain areas, mines could also be used to increase the resistance of outpost, by properly mining the approaches of an outpost the defending units could withdraw and lower the chances of being overrun. Let’s take a look an example position from the manual that uses mines and roadblocks to defend an area. To summarize, each battalion defended its sectors with their organic anti-tank defenses, whereas the regimental anti-tank company provided additional protection on the flanks and/or in the depth. The use of anti-tank mines, natural and artificial obstacles was central in setting up a proper defense. In case of an enemy attack, it was important to wait until the enemy committed its main force. Additionally, firing at lone recon vehicles was performed only in accordance with the commander the anti-tank unit was attached to. These measures ensured that the positions weren’t given away prematurely and that the maximum firepower could be used once the enemy reached an effective firing range. In this video I will cover a German Panzergrenadier-Division setup and also its precursor the Motorized Infantry Division from 1939. 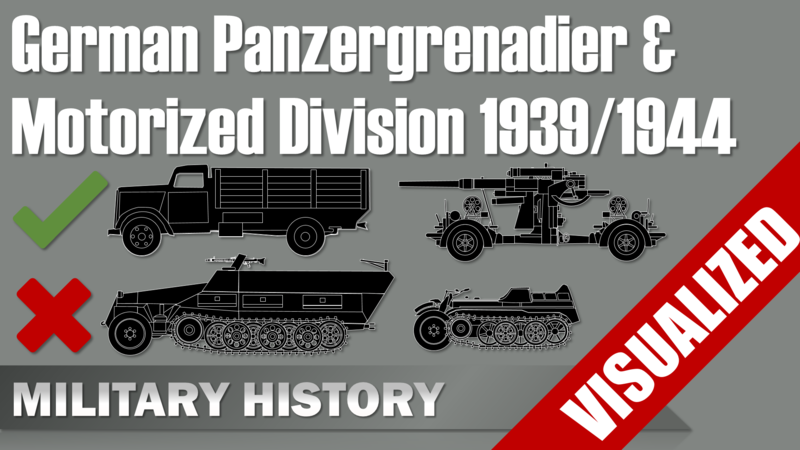 Note that the word Panzergrenadier literally translated is “tank grenadier”, but the correct term nowadays is mechanized infantry or even armored infantry, but in World War 2 most Panzergrenadiers were actually motorized infantry. So, let’s start with the motorized division. It consisted of a mixed recon battalion with armored cars and motorcycle units, 3 motorized infantry regiments each consisting of 3 infantry battalions, 1 anti-tank company and 1 infantry gun company. 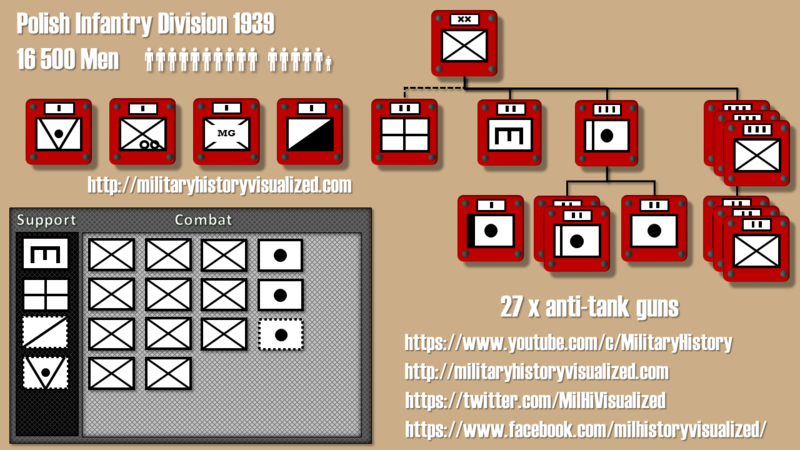 Additionally, 1 anti-tank battalion with 1 heavy MG company and 3 anti-tank companies. Note that the heavy MG Company was equipped with 2cm anti-aircraft guns and no machine guns. Furthermore, an Engineer battalion, a motorized artillery regiment consisting of 3 light artillery battalions, 1 heavy artillery battalion and 1 observation battalion. And finally a signal battalion. The main rear services consisted of a supply and transportation unit, administration and medical services. Now, let’s take a look at the numbers and try to keep the organization in view. Note that these numbers are for single individual sub-units, hence the numbers displayed won’t always add up, because in some cases they need to be multiplied. Also platoons and even smaller sub-units are not visible. For the Recon Battalion we have around 386 men, one infantry regiment had a total of 3106 men, the anti-tank battalion had 708 men, the Engineer Battalion 831 men, the artillery regiment 2837 men, the signal battalion 424. 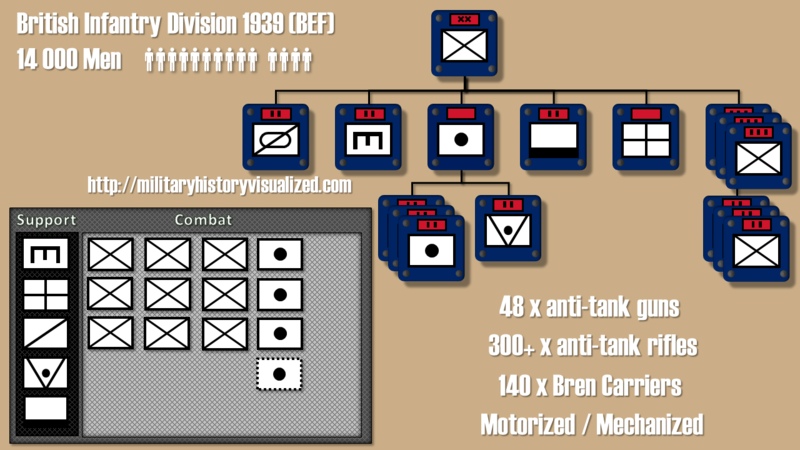 Now the sub-units of the Infantry Regiment, the 2 infantry battalions had 864 men each, and about 200 men in the anti-tank company and the infantry gun company. For the sub-units of the anti-tank battalion, there was a heavy MG company with 189 men and about 170 men in each anti-tank company. The sub-units of the Artillery regiment were 3 light artillery battalions with 540 men each, 1 heavy artillery battalion with 554 men and an artillery observation battalion with 574 men. For the non-combat units there were 984 men in the supply units, 208 in the administration units and 531 men in the medical units. In total the division consisted of 16445 men, with 492 officers, 133 officials, 2456 NCOs and 13364 enlisted men. Now, since we know how an early war motorized infantry division looked like, let’s take a look at the last official organization of this unit type in 1944, the Panzergrenadier-Division 44. Now the name can be quite misleading, because usually when somebody mentions the word Panzergrenadier they show either a picture or video footage of soldiers in or next to German halftrack. Yet, the reality was quite different than propaganda footage. Even in late war the basic layout of the Panzergrenadier Division 44 was using only trucks and no halftracks for the infantry units. After all, there were only 7 armored halftracks assigned to the whole division. Of course, there were Panzergrenadiers that acted as mechanized infantry and used halftracks, but these were limited and usually assigned to Panzer Divisions and some rare elite units. So a Panzergrenadier was usually motorized infantry and not mechanized infantry. Something, I wasn’t completely aware neither before doing this video. 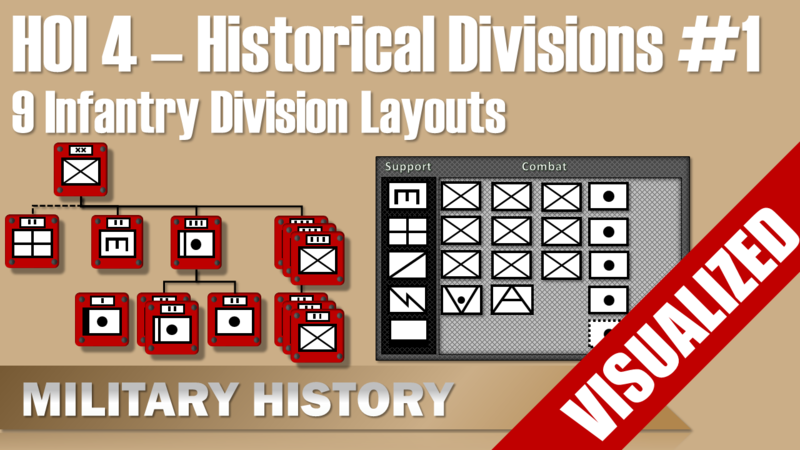 Let’s take a look at division layout. It consisted of an armored car recon battalion, 2 motorized infantry regiments each consisting of 3 infantry battalions, 1 heavy infantry gun company and 1 engineer company. Furthermore, one engineer battalion, 1 anti-tank battalion with 2 tank destroyer companies and 1 heavy anti-tank company. One assault gun battalion with 3 assault gun batteries. An Army anti-aircraft battalion, one motorized artillery regiment consisting of 2 light artillery battalions and 1 heavy artillery battalion. And finally a signal battalion. The main rear services consisted of supply and transportation units, administration, medical services, a replacement battalion and a maintenance unit. Now, let’s look at the numbers. For the Recon Battalion we have around 1005 men, one infantry regiment had a total of 3107 men, the Engineer Battalion 835 men, the anti-tank battalion had 708 men, the assault gun battalion had 602 men, the Army anti-aircraft battalion had up to 635 (min 607 men), the artillery regiment 1580 men and the signal battalion 427. 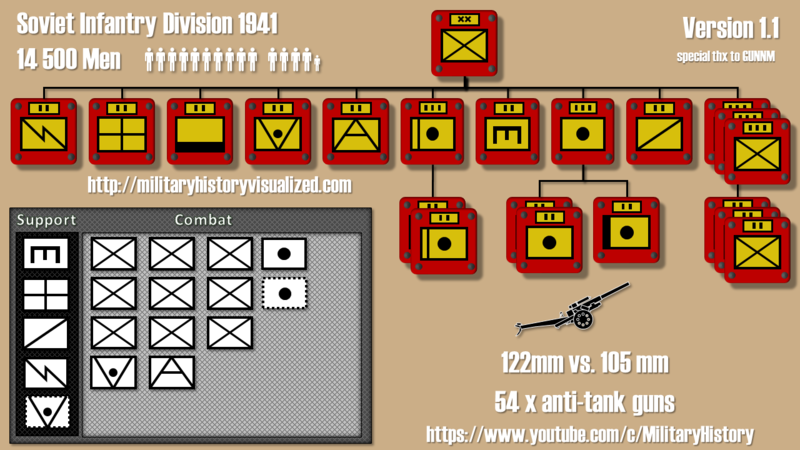 Now the sub-units of the Infantry Regiment, the 3 infantry battalions had 868 men each, the heavy infantry gun company had 102 and the engineer company 217 men. For the sub-units of the anti-tank battalion, there were 57 men in each of the 2 tank destroyer companies and 117 men in the heavy anti-tank company. The 3 assault-gun companies had 64 men each. The sub-units of the Artillery regiment were 2 light artillery battalions with 486 men each and 1 heavy artillery battalion with 516 men. For the non-combat units there were 667 men in the supply units, 233 in the administration units 530 men in the medical units, 973 men in the reserve/replacement battalion and 281 men in the maintenance unit. In total the division consisted of 14732 men, with 402 officers, 83 officials, 2766 NCOs, 11487 enlisted men and 690 volunteers. Note that these volunteers were part of the official layout of the division not some ad-hoc addition on the front line. So let’s compare these two units. I won’t cover all changes, because some are quite obvious, like minor replacements, but there were quite some major changes in organization, equipment and the overall numbers. First in terms of organization, both divisions had a recon layout, but internally the changes were quite significant. The 1939 version consisted of a company of motorcycles and an armored car company with 10 armored cars. Whereas the 1944 version had a headquarters company with 17 or 20 armored cars depending on the layout. Additionally, 3 companies of light motorized infantry with the same amount of weapons each like the motor cycle company and also a heavy company that doubled the amount of mortars. Hence, both the numbers in equipment and manpower was quite different. The 1939 version had 386 men, whereas the 1944 version had 1005 men. Now in terms of the infantry regiments, the 1939 version had 3, whereas in 1940 this number was already reduced to 2. Same goes for the 1944 version that had only 2 infantry regiments. The number of infantry battalions didn’t change. Yet, the infantry gun company was changed to a heavy infantry gun company, whereas the anti-tank gun company was removed. Yet, an engineer company was added, which had 18 flamethrower vehicles at its disposal. The engineer battalion stayed almost the same both in numbers and equipment. In terms of anti-aircraft units there was a major change, in 1939 only one company with 12 small anti-aircraft guns was available, the heavy MG company. 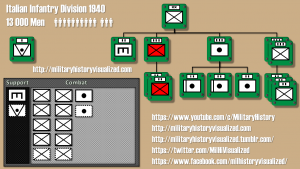 In 1944 this setup had changed significantly, there was a dedicated army anti-aircraft battalion with a heavy company and an additional light or medium company, depending on the setup. The different aa-guns were not only located in the anti-aircraft battalions, there were several in each infantry battalion, in the headquarters companies of the artillery battalions and the self-propelled AA guns were located in the assault gun battalion. This assault gun battalion, was a major change. Whereas in 1939 there were only 24 light infantry guns available, in 1944 this number had changed to 8 heavy infantry guns, but an addition of 42 assault guns clearly increased the amount of high caliber direct fire weapons to support the infantry in combat. 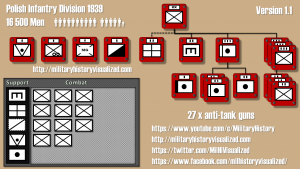 There are quite many other changes, the number of supply companies in individual units increased, furthermore maintenance and other units were added also, which is a direct result of the increased amount of tracked vehicles most notably the tank destroyers and assault guns. Now, to wrap this up, a short comparison in the equipment numbers, I choose various numbers that changed considerably and also show the evolution of certain areas. 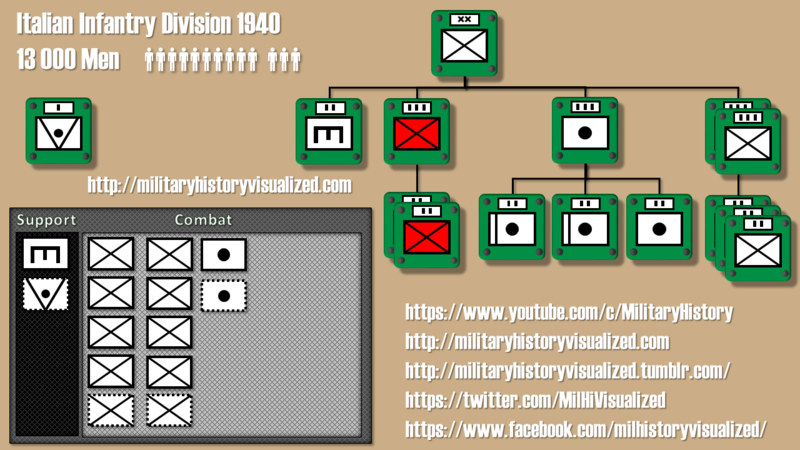 In 1939 there were a mere 31 sub-machine guns assigned to the Division, in 1944 this number increased to 1230. In terms of light machine guns the number almost doubled from 374 machine guns or should I say Spandaus to 732 light machine guns. In terms of anti-aircraft guns there was a increase from 12 light anti-aircraft guns to 63 light and 12 heavy anti-aircraft guns. There was also some reduction in equipment numbers, the 1939 division had 1323 motorcycles, whereas the 1944 layout had only 153 assigned. Yet, in 1944 the division had 322 Kettenkräder, which is basically a half-tracked motor-cycle. In terms of anti-tank capabilities the original setup had 72 anti-tank guns, whereas the 1944 had only 19 anti-tank guns of a higher caliber, since now 31 tank destroyers were used in the anti-tank role. And an additional 42 assault guns that could be used similarly. To summarize the biggest differences were in terms of equipment were the reduction of the number of motorcycles. The vast increase in anti-aircraft weaponry, the addition of assault guns and the change of most of the anti-tank capability from towed anti-tank guns to tank destroyer. Now, for all those waiting for the division layouts for Hearts of Iron IV, don’t worry, I didn’t forget you guys. There will be an update video shortly on the infantry divisions and probably one for the units mentioned in this video too. Wettstein, Adrian: Sturmartillerie – Geschichte einer Waffengattung or as download (pdf). Well, this is basically a follow-up video on my second video that I originally wanted to release quite early on, well more than 50 videos, 800 000 views and 20 000 subscribers later, here we go. The major error and blunders of the Hitler and his generals during the planning and execution of Operation Barbarossa. Since, we have dealt with the initial family issues, time to get started, I structured this video into two parts, the first part covers all the planning and preparation errors, the second part deals with errors during the ongoing military operations. 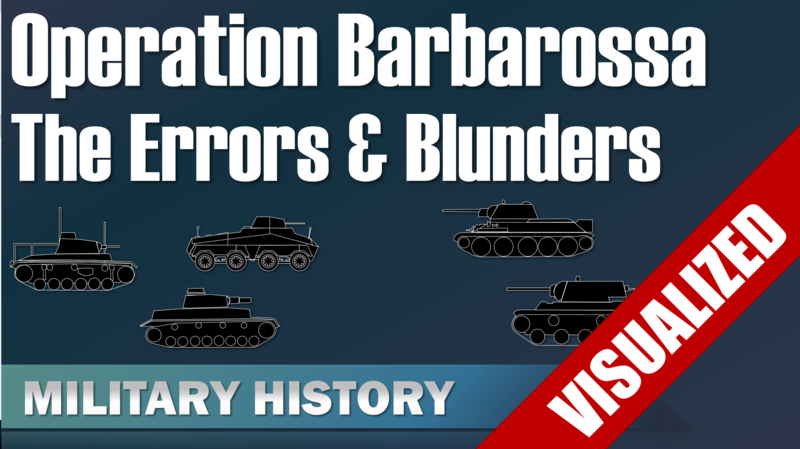 Now, a large amount of errors occurred during the preparation and planning of Barbarossa. First off, Military Intelligence. The German intelligence service for the Eastern Front “Fremde Heere Ost”, which means “Foreign Armies East” had major problems providing substantial insights about the Red Army and this was a well-known problem at the time. Ultimately the state of the intelligence was quite shocking, it was assumed that the Soviet Army had around 150 divisions, but only about 100 could be accounted for. (S. 75) In terms of reserves it was assumed that the Soviets would have enough manpower to raise another 50 divisions, but would lack the equipment to arm them properly, thus the total of 150 divisions was the assumption for German planning. (S. 69) Now according to the American Military Historian David Glantz, the Soviets raised more than 800 division equivalent. that is more than 16 times what the Germans assumed. Now, the next one, probably everyone was expecting anyway, logistics. The main problem was that the German army had not a sufficient amount of trucks nor trains even before the beginning of Barbarossa. The main problem with a lack of transport capacity is that the existing vehicles are used more often and sometimes in ways they are not fully suited, this results in additional wear and tear, which ultimately puts further strain on the supply lines. Basically, any major shortcomings in a logistical system can develop into a death spiral. In short the transport capabilities of German in both trains and trucks was insufficient and it was known prior to the conflict. There was not enough personnel to handle the rail transportations and there was a lack of construction crews to improve the state of the destroyed rail way infrastructure. At least the lack in crews could have been planned more properly without too much strain on the German industry or manpower. Now, next is the missing Grand Strategy. One major difference between the Axis and Allied forces was the lack in cooperation and Grand Strategy. 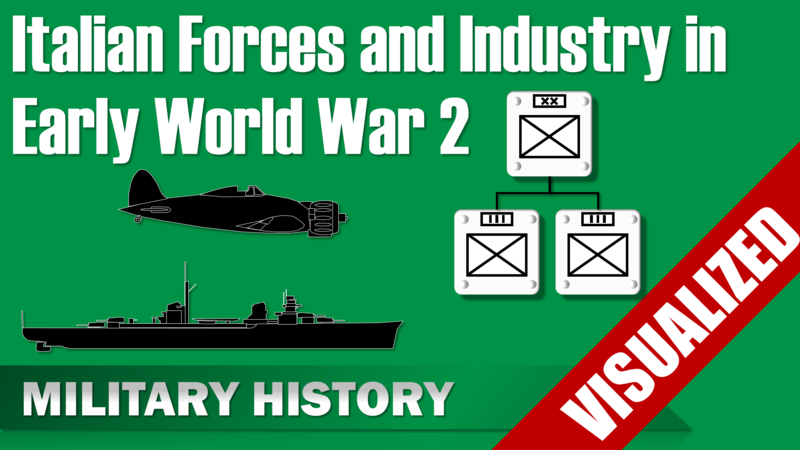 The Western Allied Forces, which had a far higher amount of resources, industry and manpower available settled on the Grand Strategy “Germany First”. Now the Axis forces, which had limited economic capabilities couldn’t agree on a grand strategy and usually not even on smaller agreements. When looking at the Axis and the Soviet Union relations the situation was quite ironic. In 1939 the Germans were basically partially cooperating with the Soviet Union due to their cooperation against Poland, the large trade agreements and establishment of sphere of influences. Whereas the Japanese were engaged in serious border conflicts with the Soviet Union, most notably the Battles of Khalkhin Gol. After the successes of the German Army in Poland and the Battle of France, the Japanese tried to reestablish contacts with Germany. Yet, Hitler would have preferred a compromise with the British, only after the British declined all German proposals and the Battle of Britain was lost, the Germans reacted positively towards the Japanese. Now, since we covered diplomatic aspect, let’s take a look at a more tactical matter. During Operation Barbarossa the German forces several times came in contact with tanks what were almost invincible to most of their weaponry, most notably these tanks were the T-34, the KV-1 and the KV-2. The German Army should have been better prepared for these encounters and they shouldn’t have come as surprises. Although the Soviets didn’t use the T-34 during the Winter War against the Finns, they used prototypes of KV-1 and the similar heavy tank the SMK in the conflict. (Source: Zaloga, Steven J. : KV-1 & 2 Heavy Tanks 1939-1945,.p. 7) Thus, the German High Command should have been aware that the Russian might have quite strong tanks. Furthermore, German Panzer tropps themselves had severe problems destroying the French Char B-1 bis in the Battle of France several times, most notably at the Battle of Stonne, where one French Tank managed to destroy 13 German ones. Yet, despite the Finnish and German experience, there were no proper actions taken to prepare the German divisions to deal with heavy or well-armored tanks. Now, let’s take a look at the biggest blunders of all and also the one that was foundation for most of the others. Namely, the wrong assumption that Operation Barbarossa would be a short campaign like the Invasion of Poland and the Battle of France. It should be noted that Operation Barbarossa was planned as a short campaign, unlike the Battle of France. Now, the assumption of a short campaign was rooted in the over-confidence of the German Army in its capabilities after the tremendous victory against its Arch-Enemy France in 1940, furthermore the underestimation of the Red Army and the stability of the Soviet Union. After all, many assumed that the Red Army would be beaten early on and the Soviet Union collapse. Most people in 1940 were thinking in World War 1 terms, when the Russian Empire collapsed and the French Army was one of the most formidable in the world. This view was not limited to Germans, many non-Axis politicians and military professionals also assumed that Barbarossa would be a quick victory for the German Army. Although the Germans assumed that the Red Army would break, they acknowledged the fierceness of the Russian soldiers even before the attack, yet the clearly underestimated the Soviet leadership, cohesion and capabilities to learn from their experience in the Winter War and early defeats during Barbarossa. To put it as simple and clear as possible for the Nazis the Jews were the real enemy and their annihilation as also the direct or indirect annihilation of many civilians in the occupied territories was part of the plan. Thus it is hard to argue that the various deadly operations and harsh treatment against non-combatants in the occupied area were blunders, because on the Eastern Front the distinction between pure military operations and ideological warfare is extremely difficult or even impossible. Thus calling this issue a blunder would mean to not fully acknowledge the inherent genocidal aspects of Operation Barbarossa. Now, let’s move to the next section the errors during the execution. The mistakes that occurred during the Operation itself are less, but also crucial and they seem to be in line with the chronic optimism that plagued the mistakes in the planning stage. Now, first I will address an error that was mainly a preparation error, namely the dissenting opinions if Moscow should be the primary target or not. This decision is highly debated, because Generaloberst Guderian wo is considered as the founder of the German Panzer Force, noted in his memoirs that he wanted to go for Moscow instead of Kiew, but Hitler insisted on conquering the Ukraine. Once I also assumed that Guderian was right, but most military historians for quite some time think otherwise and I changed my opinion. That mistake goes hand in hand with the next one, namely the lack of adapting to the losses the German Army sustained in a short amount of time. Within a few weeks the German losses were so high that the reserves were all used up, nevertheless the German Army pushed on and overextended its lines and furthermore overstretched logistics. In overall the number of reserves were too low, the German Army only had about 400 000 trained reserves in June 1941. By the end of November 1941 these troops were all used up and furthermore, there was a lack of 340 000 men even after using local volunteers for non-combat roles and many other optimizations. Yet, the number alone is already staggering enough, another problem is that of those more than 740 000 casualties many were experienced and well trained combat troops that got replaced by inexperienced men. (End of November 1941: 340k Fehlstellen (Hillebrand: Das Heer: S. 19)) Additionally, these men had been fighting for months, they were exhausted and badly supplied. Which brings us to the next point. Although, the dire situation was apparent to the front commanders. In Mid November(13th) 1941 at the conference at Orsha near Smolensk the Chief of Staff of German Army High Command met with the leadership of the Army Groups, Armies and Panzer Armies. All front commanders argued against continuing offensive operations, yet, Hitler and Halder insisted on continuing to push towards Moscow. In early December 1941 the Germans finally halted its advance, one day later the Soviets started their counter-offensive. (Castano, Vincent: The Failure of Operation Barbarossa: Truth versus Fiction p. 27-29) At this point, Operation Barbarossa, judged by its initial goals of achieving a quick victory against the Soviet Union, had cleared failed. To conclude, the main underlying problems for the German mistakes were basically, a strong optimism that prevented any worst-case scenario planning, an underestimation of the enemy and an overestimation of the Germans Army capabilities. Ironically or unsurprisingly, depending on your view on the German leadership, this didn’t really change in 1942. Although in 1942 unlike to 1941, there was no real alternative, thus these underlying problems turned into severe habits that continued til the end of the Second World War and maybe even beyond, because quite many people still to this day claim that the mud and the Winter stopped the Wehrmacht and not the Red Army. 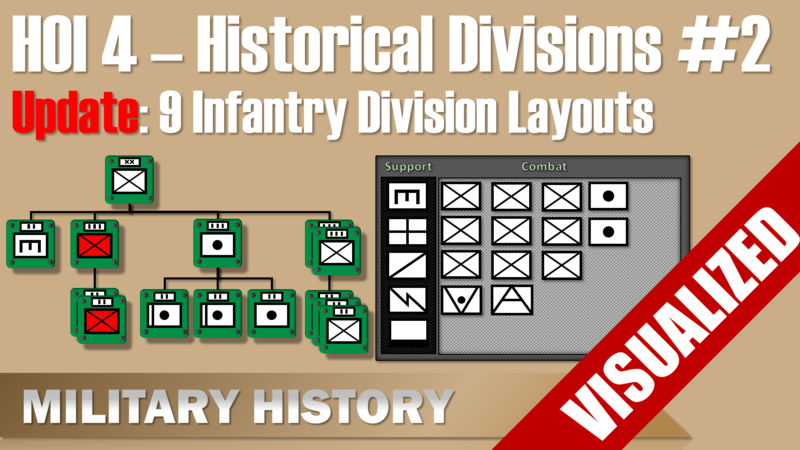 In this video I will cover several Infantry Division Layouts from World War II. Although certain parts of the content is tailored for Hearts of Iron players most of the information is military history, only the initial remarks are mostly Hearts of Iron and methodology specific, so just skip ahead on click on the annotation on the screen. Be aware though that these layouts are aimed at being as historical as possible within the Hearts of Iron division builder, thus I am not sure how well they work in HOI 4. This is first and foremost a military history channel, thus I am mainly here for the historical flavor, the German accent and not to support your ambitions in conquering the world, at least for now. I won’t use the division builder, since I generally try to avoid any copyrighted material and it would actually make everything more complicated and time-consuming. Yet, you will get in one shot the proposed HOI 4 setup and the historical setup together, so you can basically copy it and also learn a bit about the real units too. On the homepage, you can find the proper high resolution screenshots of these layouts see the link on screen and in the description. Some words about methodology and accuracy, if you want to discuss these layout listen to this section very carefully and if you can’t wait for the layouts, you might skip ahead by clicking the button on screen. Well, figuring out the correct layouts can be quite complicated. Here are a few reason why. 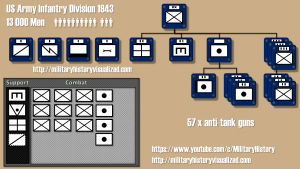 You need to be aware that some divisions – especially tank divisions – changed quite considerably throughout the war, thus I usually provide a date for each layout. Another major pitfall is the naming, what one country called a regiment was sometimes something different in another, thus this it was not as straightforward as it seems. Also there were even quite some difference within each country, e.g., a German tank division in 1939 had way more tanks than in 1941, or an US Army Battalion in 1942 was usually larger than an US Army Battalion after the reorganization of September 1943, well, except for two divisions of sixteen armored divisions. 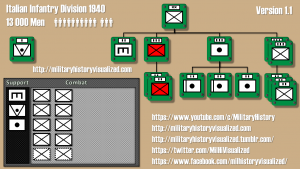 Hence my approach was as follows, it consisted of looking at the data in hearts of Iron, checking the historical division layouts then compare these information to equipment and manpower tables to see if the numbers match for different units. This process revealed quite some interesting information about hearts of Iron too. First I looked at the data of Hearts of Iron, namely how many manpower and equipment each unit had. This confirmed my assumption that the so called support companies are more like support battalions, only the three smallest ones the engineer, AA and artillery company have 300 men, the others have 400 or even 500 men. Whereas companies were usually around 100 to 200 men. Furthermore, the number of artillery guns for an artillery battalion in game is 36, whereas in real life this was the number of three battalions at least for the German and US Army Infantry division. I don’t know if this is an error on behalf of paradox or if an artillery battalion in game actually should represent a regiment or maybe it is for gameplay balancing reasons. For this video I assume that an artillery battalion in game, is also an artillery battalion historically, if this is not the case, just divide the number of proposed artillery battalions by 3 and you should be fine. The second step was to look at the organization of these units and the third step was to look at the number of equipment tables and compare if it matches the organization, because the organization can sometimes be misleading. As an example. 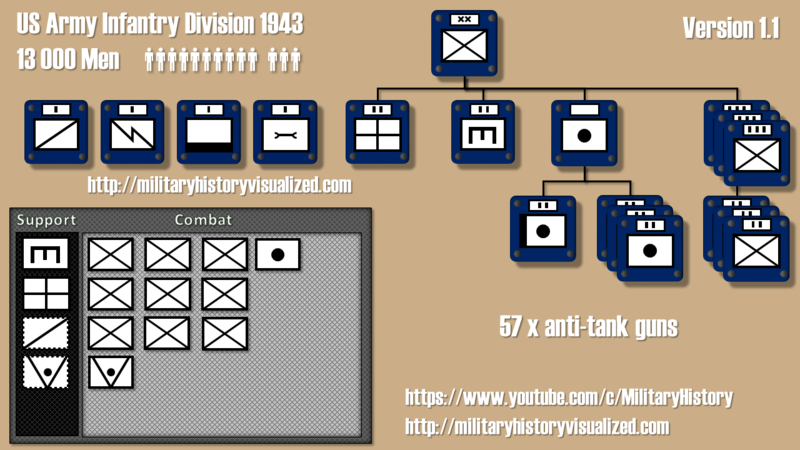 although an US Army infantry division didn’t have a dedicated anti-tank battalion like a German infantry division, but it had 57 anti-tank guns whereas the German division had only a few more with 75, but some these were also part of the recon battalion, so one might argue that the US Army Infantry division should have a dedicated anti-tank unit in-game if the German Infantry division has one or both should have none. As you can see it is a bit complicated, thus, take all the following information with a grain of salt, because I had to use a wide variety of sources of different quality and level of detail, which is problematic in itself, but additionally the chances for errors increases due the variety and amount of data. To balance this, I usually added a short explanation why or why not I went with the proposed setup and provide the basic data for my reasoning. So, let’s get started, the Allied Grand Strategy in World War II was “Germany First” and it worked out, so let’s begin with a German Infantry Division from 1940. For support units, an engineer, anti-tank, recon, signal and medical unit. 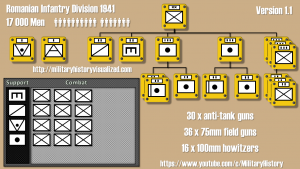 The regular 3 times 3 infantry battalions should get an addition of 2 battalions due to the large amount of men in the division and finally 4 artillery battalions. Note that for all divisions the non-combat units: logistics, medical and maintenance are the most debatable, because in my sources this information is often not included or limited. Furthermore, their functions sometimes were performed by non-divisional units in several armies. I hope you have your Hammer and Sickle ready, next is a Soviet Rifle Division from April 1941. It consisted of an a signal battalion, a medical battalion, a supply battalion, an Anti-tank Battalion, an anti-aircraft battalion, a Light Artillery Regiment with 2 battalions, a sapper battalion, one Howitzer Regiment with 2 battalions and 1 heavy battalion, a recon battalion and 3 infantry regiments with 3 battalions each. Yeah, this one seems to tick off all boxes. 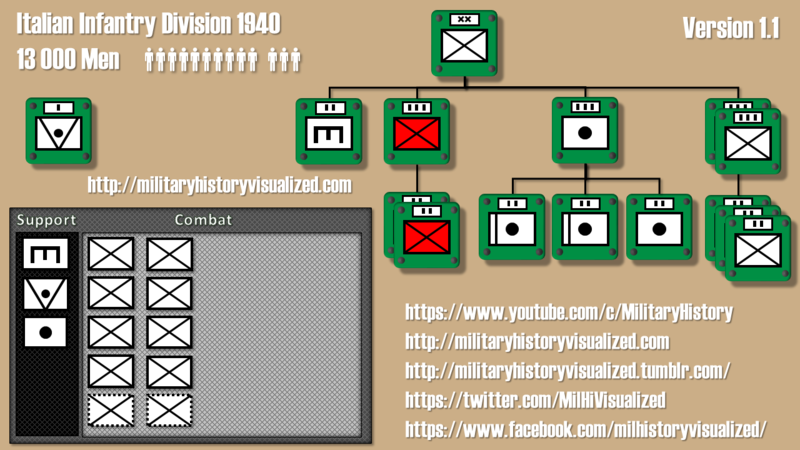 Yet, in total the division had only around 14500 (14454) men. But let’s take a closer look at the data, now the number of five artillery battalions sound impressive and the firepower is also clearly more than that of the US and German unit. The number of heavy artillery above 150mm is the same, yet whereas the US and German units use 105 mm guns, the Soviets used 122mm howitzers although 4 less, but additionally they had several 76mm howitzers and cannons, which means that the firepower in artillery at least equal if not greater than the German division. Furthermore, the total number of 54 anti-tank guns is lower than the German division, but similar to the US setup. For support units, an engineer, medical, recon, signal and logistical unit. Then the regular 3 times 3 infantry battalions, to these add one anti-tank and one anti-aircraft battalion. Finally, definitely 4 if not 5 artillery battalions. 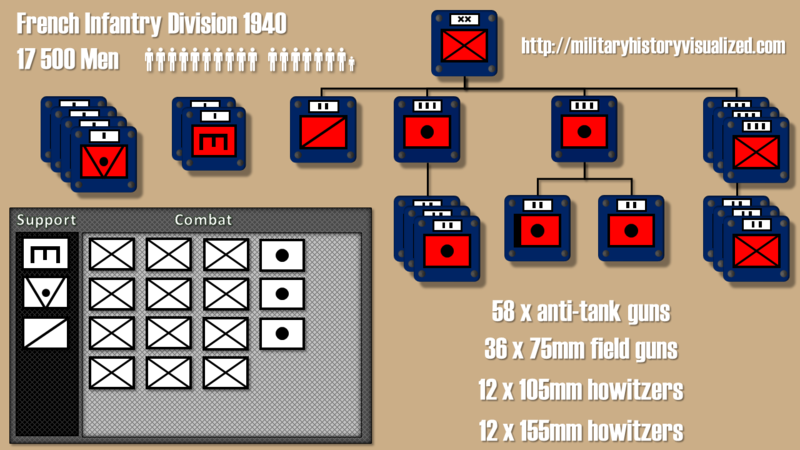 Time for a little bit of freedom, so let’s look at the US Army Infantry division layout from July 1943. It consisted of a Medical Battalion, an Engineer battalion, a divisional artillery unit with a heavy artillery battalion and three artillery battalions. And finally 3 infantry regiments each with 3 infantry battalions. In total this division had around 13000 men. For support units, an engineer, an optional anti-tank and a field hospital unit. Then the regular 3 times 3 infantry battalions and finally 4 artillery battalions. Now, the German recon unit consisted to large part of cavalry and only a few armored cars, whereas the US unit had halftracks and 13 armored M8 cars, thus only could also argue that a recon unit could be added as an additional support unit. Next up something for those people that love tea, the British Infantry Division in 1939 of the British Expeditionary Force. Now the British unit names were a bit different, they used the names Brigades and Regiments, although those units were usually had the manpower of Regiments and Battalions, I will use the original names, but symbols that are closing in representing their actual strength. 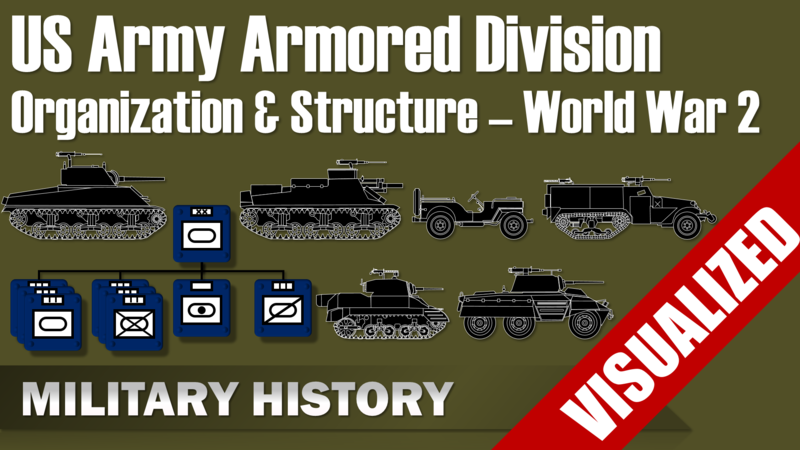 The division consisted of a Division Cavalry Regiment that was mechanized, an Engineer Battalion, a Divisional Artillery Unit that consisted of 3 field artillery regiments and one anti-tank regiment, furthermore a Supply Unit and a medical unit. And finally 3 infantry Brigades each with 3 infantry battalions. In total the division had a bit short of 14000 men. For support units, an engineer, a medical, a recon, an anti-tank and a logistics unit. Now, although the number of anti-tank guns was only 48, the unit had a large amount of anti-tank rifles and the French provided anti-tank guns for the British divisions, thus an anti-tank unit seem justified. Then the regular 3 times 3 infantry battalions and finally 3 or maybe 4 artillery battalions, because the British division fielded 72 field guns of the 18 and/or 25 pounder type. Furthermore, the unit was quite well motorized and even mechanized with 140 Bren carriers, thus one actually could replace the regular infantry with motorized or mechanized infantry. 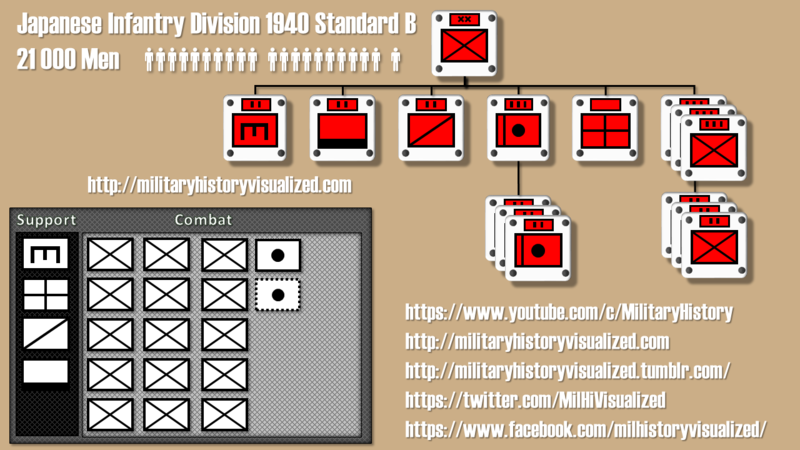 Now the war situation may not necessarily develop to your advantage, nevertheless let’s look at the Japanese Infantry division Standard B around 1940, note that these division varied to a certain degree. It consisted of an engineer regiment, a transport regiment, a recon or cavalry regiment, Division medical services, a field artillery regiment with 3 field artillery battalions and three infantry regiments with 3 battalions. Note that these artillery battalions were equipped with 75mm guns, thus having far less firepower than all other nations. Yet, these divisions had a very high amount of manpower, depending on the setup between 18000 to 21000 men, thus even outnumbering the German division by far. For support units, an engineer, a medical, a recon and a logistical unit. The regular 3 times 3 infantry battalions should get probably an additional 6 battalions. Finally, I think one artillery battalion or at most 2 battalions considering the rather weak firepower of the 75mm howitzer in contrast to the equipment of other nations. Everyone loves Pizza, but I only can offer you one slice, time to look at the Italian Infantry division of 1940. Now, my sources on this one are a bit varied, I have good German source with the overall numbers and high-level organization, but for more detailed information I rely on the Handbook on the Italian Military Forces from 1943, which was created by the US Military Intelligence during the war, so it might not be 100 % accurate, but so far these handbooks are usually quite reliable in terms of unit organizations. For support units, an engineer unit and with three eyes closed an anti-tank unit. 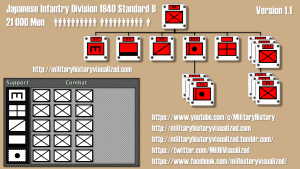 For infantry, we use the 2 times 3 infantry battalions and add an additional 2 battalions, but maybe a third or even fourth, because the total number of men is similar to that of an US Army infantry division, which had way more support units. Finally, I think one or maybe two artillery battalions, because in total there were 24 guns with 75mm and 12 howitzers with 100mm present. It consisted of a recon group, a field gun regiment with 3 battalions, a howitzer regiment with one heavy howitzer battalion and a regular one, 3 infantry regiments with 3 battalions each. Additionally, there were several anti-tank companies with a total of 58 anti-tank guns and 2 engineer companies, which were originally organized in a battalion but reorganized in 1939. In total the division had around 17 500 men. But note that in this case my sources are quite sparse and of limited quality. For support units, an engineer unit, an anti-tank unit and a recon unit. 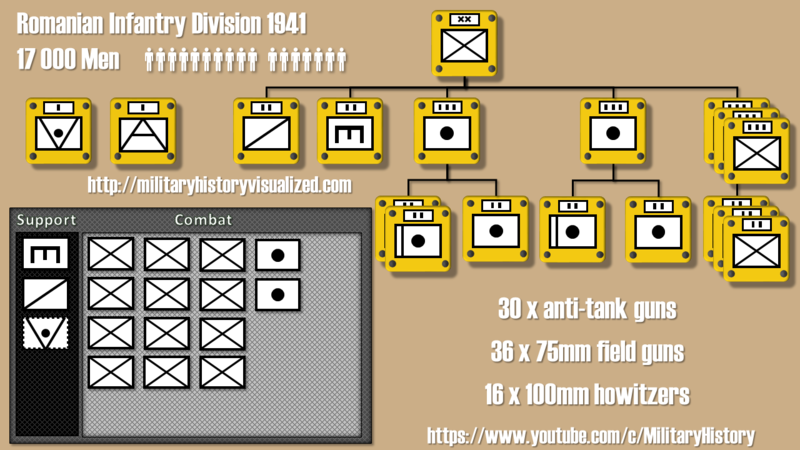 The regular 3 times 3 infantry battalions should get an additional 3 battalions, because the division has more men than the German division and also less support units. For the artillery battalions, I think three are in order, because it had 36 field guns with 75mm, 12 howitzers with 105mm and 12 howitzer with 155mm. So, in case you want to go into space, here is the Polish infantry division organization for 1939. In this case my data is way more limited than with the previous divisions, especially in terms of the support units, so keep a bit more salt ready. The division consisted an Engineer Battalion, a light artillery regiment consisting of two light artillery battalions and one regular artillery battalion. Yet, it also had a small detachment with bigger guns, but overall it couldn’t compete with the US or German division in this regard. And as usually it had 3 infantry regiments each with 3 infantry battalions. It had several medical units, but I have no numbers, nevertheless I assume it would be sufficient for a medical battalion. Similar to the German division the Polish division has more than other countries with around 16 500 men. For support units, an engineer, a medical, maybe a recon and with two eyes closed an anti-tank unit. The regular 3 times 3 infantry battalions should get two additional battalions, 2 artillery battalions and maybe a third artillery battalion. It consisted of a recon battalion, an engineer battalion, a field artillery regiment with 2 light battalions and a regular battalion, an artillery regiment with a light field artillery battalion and regular battalion and 3 infantry regiments with 3 infantry battalions each. For support units, an engineer, a recon and with two eyes closed an anti-tank unit. The regular 3 times 3 infantry battalions should get probably an additional 3 battalions. Finally, I think two artillery battalions, because in total there were 36 field guns with 75mm and 16 howitzers with 100mm present. 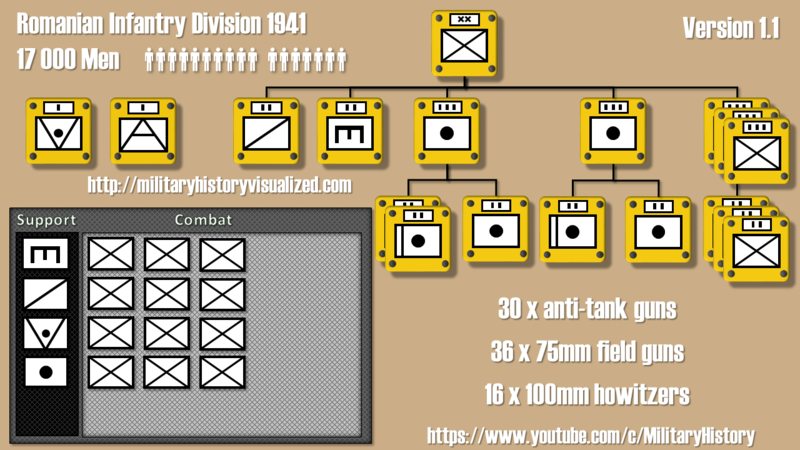 The structure of the September 1943 divisions was without regiments, hence the largest sub-unit is the battalion. The division consisted of 1 Signal Company, 3 Tank Battalions, 3 Armored Infantry Battalions, the divisional Artillery consisting of 3 armored field artillery battalions, 1 Mechanized Cavalry Recon Squadron, 1 Armored Division Trains with a Medical Battalion and an Armored Maintenance Battalion. And 1 Armored Engineer Battalion. 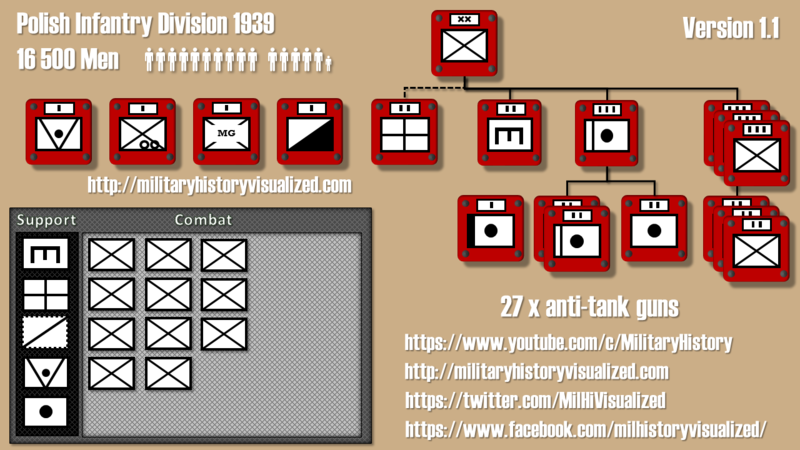 Now every of these Tank Battalions consisted of three Medium Tank Companies and One light Tank Company. Let’s take a closer look. 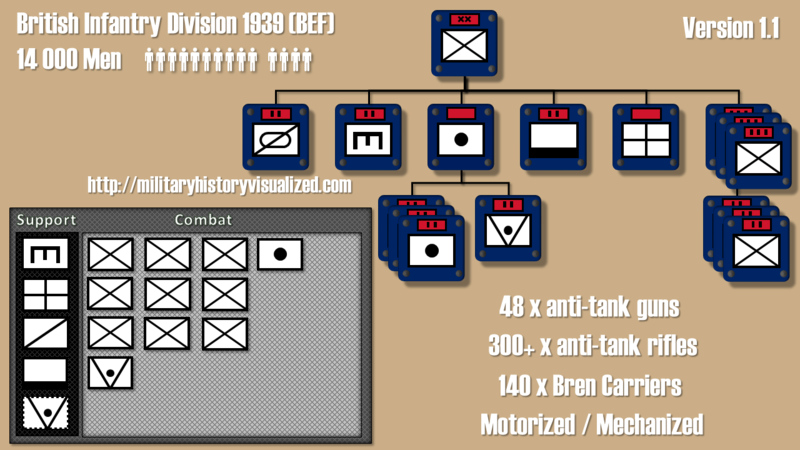 The Medium Tank Company consisted of an HQ section and 3 Medium Tank Platoons. The HQ Section consisted of two M4 Shermans, one M4 with a 105 howitzer and a jeep. Each of the Medium Tank platoons consisted of 5 M4 Shermans. At first, some word about the general organization of Italian Army before the war. Like other countries Italy drew lessons from experiences in Spain and Ethiopia, yet their forces were still in reorganization when the war started and the industry couldn’t match the requirements for the required motorization or even the basic equipment that was needed. In 1937 the Italian Army restructured its divisions from the common system of tripartite to a bipartite system, the so called “binary” system, where each infantry division only consisted of 2 infantry regiments instead of 3. 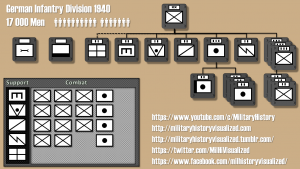 Something that is also portrayed in Hearts of Iron III and Hearts of Iron IV, as you can see here for the division builder of an Italian division in 1939 and a British division in 1939, but be aware though that the Hearts of Iron IV basic divisions layouts lack artillery regiments, furthermore the so called support companies historically usually were battalions, as you can see here with a basic German infantry division from 1940. Yet, from a game design perspective it makes sense to call them companies, because so you can’t mix them up with your regular battalions when writing about division compositions on the forums. Anyway, if you want to learn more about unit organizations, check out the playlist on my various organization videos. Next up, is a brief look at the Situation in September 1939 and then a more detailed look at the state in June 1940. Let’s look at the state of the Italian forces in the beginning of the War in September 1939, when Italy was still at peace. In short the Situation of the Italian Armed forces in September 1939 was abysmal. Yet, you need to keep in mind that Italy didn’t enter the war before June 1940. 11 other division for special purposes. The Navy was better equipped in terms of basic supplies like food and ammo, but it also lacked anti-aircraft capabilities on its ships and in its bases. Yet, there was severe lack of fuel. Still, in comparison with the other branches the Navy was the best equipped and prepared. Now, after the Italian declaration of war in June 1940 the situation was a bit different, but not much, but let’s take a more detailed view. First the Army, in June 1940 Italy entered the war with a total of a bit less than 1.7 million soldiers (1 687 950) and a total of 73 divisions.. The most important differences here are the low number of NCOs in the Italian division, NCO form the backbone of every army, thus this lack of leadership definitely didn’t improve the overall quality of the division. Furthermore, the biggest Italian gun had 100mm and only 12 were assigned to a division, whereas the Germans had 3 times that and additional 18 guns with 150 mm of caliber. Now, the Italians had a variety of guns ranging from 75mm to 20mm, but almost all in low numbers and of various types this is basically a logistical nightmare with limited firepower, especially in combination with the severe lack of transport capacity and weak industry. Also in terms of infantry support weapons like mortars and machine guns the Germans had an advantage. One can assume that Mussolini would get führious from the “insufficient resources” icon popping up all the time, if he would play Hearts of Iron. One can assume Mussolini would have gone mad from the “insufficient resources” icon popping up all the time, but he was probably already mad already. Now, the Italian Navy was by far the strongest part of the Armed Forces. For the Mediterranean the numbers of the Italian fleet were quite considerable: (Schreiber, Gerhard: S. 77 , in Deutsche Reich und der Zweite Weltkrieg, Band 3) Here is a comparison between the Italian, British and French Fleets assigned to the Mediterranean. There is a strong tendency to give the Italian soldiers a bad reputation for being cowards and unreliable, which certainly is influenced by the fact that in World War 1 the Italians turned against their former Allies the German and the Austro-Hungarian Empire. Nevertheless, in World War 2, Italian soldiers fought as brave as their allies and foes, thus there is no reason for the continuous disrespect about their combat capabilities, which was mostly a result of the poor state of their industry, equipment, weaponry and supply situation. As said before soldiers deserve our respect, even if we don’t share their side and/or views. Let’s begin, prior to 1914 all sides envisioned a highly mobile war with a strong focus on offensive operations. Furthermore, artillery was mostly seen as a direct fire weapon that would be brought forward with galloping horses at crucial moments and support the attack of the infantry. As you can clearly see there was a constant increase. Now let’s take a look at the consumption rate in the Great War. Yet, the national stockpiles and industries weren’t sufficient for this amount of ammo consumption. The French assumed a consumption of 100 000 rounds per month, but used 900 000 rounds, considering that in the First Balkan war 254 000 rounds were used per month, this number was either dated or didn’t take into account the latest developments. Thus, at beginning of the war in 1914 the French Army had less than 5 million rounds in stock. The Russians had 12 million. The Germans more than 20 million, but they also had more artillery than the French. Besides the shortage of ammo, there was another problem, the main type of ammo in 1914 was the shrapnel round. A shrapnel round was filled with iron balls that extended in a cone-shaped pattern when it exploded (The Field Artillery – History & Sourcebook p. 48), so in a way it acted like a flying shotgun. It could cover an area of about 25 meters (82 ft) wide and 150 meters (492 ft) long (values for a 75mm gun). Shrapnel was only useful against troops on open ground, because it was quite ineffective against dug in troops and basically useless against fortifications. Although ammo was a major problem for all nations, when it came to heavier guns like howitzers, there was a clear difference between France, the German and the British Empire. The French fielded an excellent 75mm field gun the M1897, but they assumed it would be able to deal with all targets, thus there was only a very small amount of heavy long-range artillery available. In contrast the Germans took lessons from the Russo-Japanese (1904-1905) war and had a larger number of heavy guns, but their doctrine was lacking and thus couldn’t really exploit the numerical superiority in heavy artillery. The British had taken lessons from the Second Boer War (1899-1902) and had a large number of heavier guns, yet the British Expeditionary Force that landed in France 1914 had only a small amount of these heavy guns with them. (Steel Wind: p. 10 -11) Hence, every side had its own far share of limitations, but let’s take a closer look at the numbers. In 1914 the French had 3840 75 mm guns, but they only had 308 guns with a larger caliber than 75mm. In comparison the Germans in 1914 had 5086 77mm field guns and 2280 larger artillery guns, whereas the British in 1914 had 1608 light guns and 1248 heavy guns in total, but only a small portion in the British Expeditionary Force in France. Now, back to 1915, after the war reached a static stalemate on the Western Front the Armies began to adapt their techniques. The artillery units also faced a major leadership problem, due to the rapid expansion in 1914 and 1915. This was especially true for the French artillery, because many artillery NCOs were transferred to the machine-gun units. (Steel Wind: p. 12-13) Thus, many of the techniques needed to kept simple. One of the major changes was to shift to effective indirect fire. Since Napoleon the basic technique was to mass fire, but due the increase in firepower from small arms and machine guns, the artillery needed to be deployed behind the front lines. Hence, the only possibility to mass fire was by using indirect fire. Basically, two approaches for indirect fire were developed and used in the Great War: Observed fire and unobserved fire. Observed fire as the name suggest needs an artillery observer, he locates the target and communicates the coordinates accordingly, furthermore if necessary information to adjust range or direction is passed on. 1) The Observer needs a line of sight to the target. The alternative to observed fire was unobserved fire, yet it relied on maps and was done without adjustments. This is one of the reasons why modern military maps are usually way more accurate and full of elevation information, but at the beginning of the war that information was usually not available. Another problem was, that since no adjustments were performed the fire would also be incorrect, due to the fact that firing tables were based on standard data, which relied on standard conditions and well, you don’t have standard conditions in real life. Factors like weather, the conditions of the gun tubes and the different quality of ammo lead to inaccurate unobserved fire even if the maps were precise enough. (Steel Wind: p. 12-13) To address these challenges various methods like registration and other techniques were developed during the war to allow for more precise unobserved fire. To counter these, the so called creeping barrage was developed, which slowly moved ahead of an infantry attack, first shelling the target area and then moving to the next area. The problem with the creeping barrage is that the attacking infantry had to move through heavily shelled terrain during their advance. (Steel Wind: p. 14) To put it simply, in 1915 the armies developed or consolidated their abilities in indirect fire and basic artillery coordination. 4 75mm field guns at a range of 2500 meters needed about 600 rounds to sufficiently destroy an area of 25 by 30 meters of barbed wire. Of course the number of shells increased at a range of 7000 meters the amount of rounds doubled to 1200. (Steel Wind: p. 14) Now, destroying barb wire was not some rare objective. The artillery basically became a tool for almost anything, no matter how suited or unsuited it was. This lead to extensive shelling of enemy positions prior to attacks. (e) To destroy the machine guns wherever they can be located. The limited effectiveness of a long preparation attack can probably best illustrated by taking a look at the British attack at the Somme in June/July 1916. They performed a 7 day preparation attack in which about 1500 (1537) guns fired about 1,6 million shells ( 1 627 824) at the German positions, as reminder the French started the war with about 5 million shells. When you joined the great fall-in in Nineteen-Sixteen. Or young Willie McBride, was it slow and obscene? 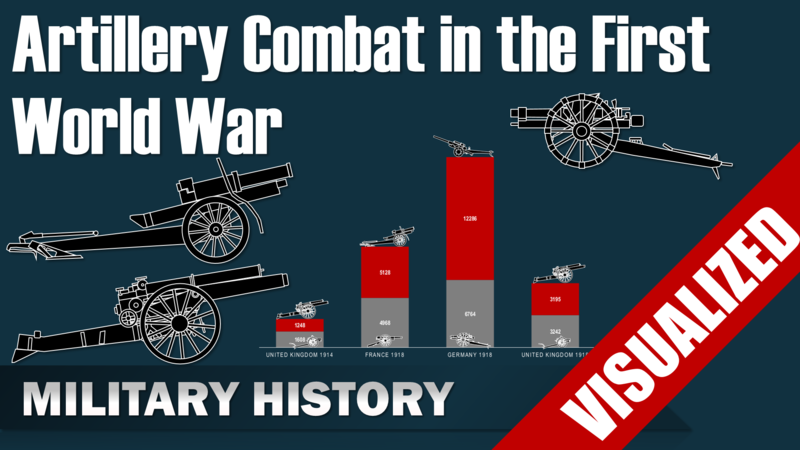 To summarize, the First World War saw an extensive change in the use of artillery, first it was deployed and used almost like in Napoleonic times, yet soon it was forced off the front lines due to overwhelming fire power. This resulted in a switch to indirect fire, which the armies were mostly not adequately equipped nor trained for. After adapting indirect fire, the artillery was seen as a tool for everything from destroying enemy obstacles to annihilating enemy troops, a task that it was not suited for.In the final phase it was deployed and used with a clear focus on its abilities and usefulness against specific targets, which resulted in major success and the establishment of effective principles. These principles to a large degree are still the core of modern day artillery to this day. Why did the German Aces have so many air kills? When it comes to World War 2 many people often cite the high kill numbers of German and Japanese Pilots. The problem is they usually try to use these numbers to make various points on how effective the Axis forces were, well, there are many problems with this. Luckily the third most successful German ace of World War Günther Rall, actually spoke out on this in a polite and indirect manner. He answered the question: why did German Aces have so many air kills compared to Allied pilots. I will use his answer and expand on it a bit. This strategic disparity in planes didn’t necessarily transfer down to the tactical situation. Because the Germans could to a certain degree decide when, where and how to engage the Allied aircraft, particularly when they were attacking Germany and the occupied territories. Thus, tactical victories were still quite common and those improved the kill counts of German pilots. 2) Second, Western Allied pilots usually had a limited number of missions to fly and then they were rotated out or could return home. Due to the lack of German pilots this wasn’t a possibility, hence German pilots usually fought until they were killed, captured or incapacitated in one way or another way. There were other factors as well, like the initial superiority of German training in combat pilots due to the pre-war build up and experiences from the Spanish civil war. Furthermore, nearly every major country used a different system for the counting of kills and losses in World War 2. Additionally, especially in air combat the kill claims for all sides could be up to twice as high as the losses of their enemies. In short, there are many problems with deriving valid and comparable kill to death ratios from these value across different countries. But let’s take at the bigger picture, one way to properly determine the effectiveness of combat pilots is by taking a look at the average pilot, because in a total war the achievements of exceptional individuals rarely have an effect above the tactical level. But the combined force of a large number of soldiers, pilots or sailors usually is the determining factor that has strategic effects. This is the reason why proper training programs were so important, something both the Germans and Japanese didn’t put enough emphasis on during the war. Thus, armed forces should not be judged solely based on their current or initial quantity and quality, but also in their ability to maintain this quantity and quality during a war. To conclude comparing the individual achievements of aces usually doesn’t provide meaningful information about major aspects of the air war. It usually only serves as an excuse for nationalistic tendencies and/or contempt, which in a way is probably the same thing. Most people note that national pride is important, and I agree with that, but I think real pride has no need for a comparison, it comes from within and not from an outside measuring stick. After all, it is important that we respect the achievements and service of all men and women that served, no matter if they flew 50 missions with no kills or were aces with more than 200 kills. Quite many pilots that once fought each other became friends after the war, I think they serve as great examples that mutual respect is a true virtue of a hero and that despite various differences an honest agreement on core values like respect is more important than the color of our flags. 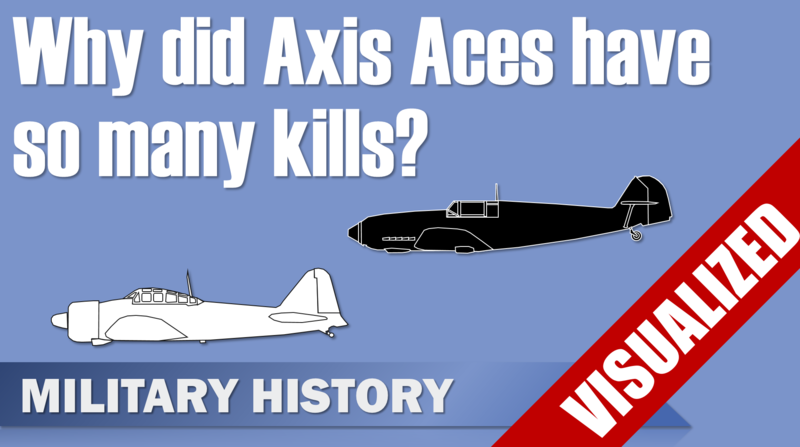 Ask Historians (reddit) – Why did German fighter aces have so many more kills? Vikings are often portrayed as fierce warrior savages that pillaged and plundered through Europe that were mostly undefeated. Well, according to recent research most of it is wrong or not really distinctive for the Vikings. So, basically a lot of information is wrong what seems to be common knowledge about the Vikings and I am not talking about superficial stuff like horned Helmets here. Anyway, let’s combine some common views and myths about the Vikings into one statement: Vikings were fierce undefeated and brutal warriors that lusted for battle, who pillaged and plundered through the peaceful Christian coastal areas of Western Europe like a gang of hoodlums and committed unspeakable atrocities. Time to examine the various parts of this little sentence. This also brings us to the next part the brutality and atrocities. The Vikings being fierce and undefeated warriors. It is without question that the Vikings were formidable foes, especially since we know that they were smart and well-organized, which is a crucial element for conducting effective military operations. Nevertheless, they also suffered notable defeats besides their notable victories and thus were far from undefeated. How they were stopped from Raiding? 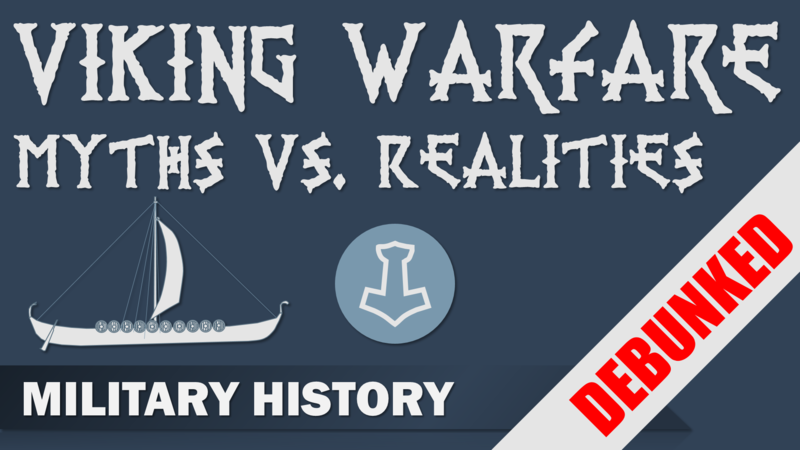 So, since we tackled the myths, one question remains, how could the Vikings stopped from raiding? And finally, it should be noted that Viking battle techniques and weapons were actually quite similar to that of their foes. The most distinctive feature of the Vikings was their emphasis of ships, strategic mobility and logistics, which allowed them to outmaneuver their enemies before they could properly react. Thus, the main difference between Viking Warfare and that of their foes was on the strategic not the tactical level. And we all know it is more comforting for the ego to state that one was overwhelmed by brutality rather than to admit that one was outsmarted by so called Savages. Now, if you are interested in Vikings I have two recommendations for you, first the book Viking World from 2011 with more than 700 pages, it is full of scholarly articles about everything concerning the Vikings, I only read a few articles but those were excellent. And second an album trilogy from the German Heavy Metal Band Rebellion, which contains some of my favorite songs, most notably Ruling the Waves and God of Thunder, see the links to videos and amazon in the description.